Nottely River Campground is located in Union County, near Blairsville, Georgia. 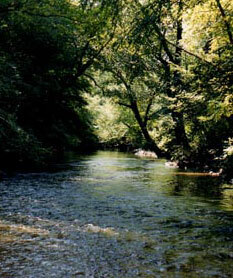 Most camp sites are under trees, right on the river, so you can enjoy the sound of rushing water. All sites have power and water and there is a bathhouse with hot showers. Nottely River Campground also offers full RV hook-ups and rental cabins. Tents and pop-ups are always welcome. The campground sells ice and firewood and there are tubes for rent so you can enjoy floating on the river. All sites have a picnic table and fire ring. For your convenience, there is a dump station. Pets are allowed in the camp sites. Come camping and let crickets and tree frogs lull you to sleep. Fishing, tubing, swimming, ballgames, badminton, frisbee, horseshoes, birdwatching, and nature walks provide lots of outdoor fun for everyone. Bring your bicycle or walking shoes! (Three times around the field is a mile.) There's roasting hot dogs and marshmallows over the campfire. At dusky dark, don't be surprised if the fiddles come out and blue grass music sets the mood. 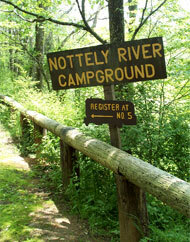 Nottely River Campground has developed a unique personality over the years. It is a great place for special events, group camping, weddings, and reunions as well as camping for the weekend or taking a longer vacation. The natural beauty of the area, the fresh air, the clean river water, and the friendly people combine to create an unforgettable camping experience. The place has a rich history and if you like, you can become a part of it all. Please call 706-745-6711 for reservations and more information.